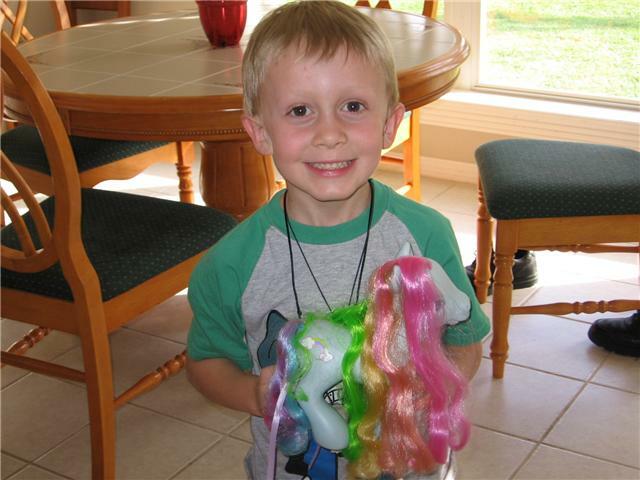 I just wanted to tell you that we got the Rainbow Dash Pony today, and my son was absolutely delighted. He's become enamoured of My Little Pony of late and Rainbow Dash especially, and very badly wanted a big one just like the one they had at his daycare. Unfortunately, a little research turned up that the large 'Styling Rainbow Dash' ponies stopped being made in 2007, and appeared to be scarcer than hen's teeth, especially for a price I could afford. And then, like a light from the heavens, I found SavetheToys.com, with a Rainbow Dash in the exact right size and, may I say, an exceptional price. My little guy has been waiting with baited breath all weekend for her to arrive, and has been holding her in his arms all evening. Thank you so much for making my son's week! I've included a picture of him to show you how happy he is.